Tourism Minister stands behind his statement opposing a return to pre-1967 lines. 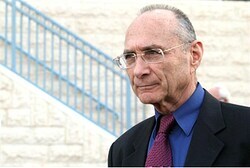 Israeli Tourism Minister Uzi Landau gave a wide-ranging interview to Mazal Mualem for Al-Monitor Israel Pulse the day after Landau publicly quoted the well-known maxim of former Foreign Minister Abba Eban, "The '67 borders remind us of the borders of Auschwitz," at the beginning of a government meeting that took place on Sunday and was widely quoted in news broadcasts. When Min. Landau was asked if "the Holocaust comparison [is] somewhat exaggerated" given the President's "vision of two states," he added: "So he is mistaken! But my argument is not with any specific person". "The president of the state talks in his own name. After all, he has no authority to speak in the name of the government. I am in the government first and foremost to say these things when it is necessary to say them, and I'm saying them now. "Not only there will not be peace, there will be no coexistence. Nor quiet. An agreement based on these guidelines will only lead to increase in terror. Exactly as the Disengagement [from Gaza in 2005] led to increase in terror and strengthening of Hamas." "That doesn't make these borders less Auschwitz-like. Before '67, they didn't have Katyusha rockets and missiles to the extent owned today by Hizbullah in the north and Hamas in the south that constitute a strategic threat to Israel. One thing must be clear: A Palestinian state is not the solution." "I will quote Mr. Peres once again, who said that we should never take the defense system's recommendations as absolute truth. [Former Prime Minister Menachem] Begin bombed the Iraqi reactor against the opinions of all the heads of the service and defense systems [in 1981]. The heads of IDF Intelligence Branch, former chiefs of staff, were the ones who pushed for Israel to voluntarily hand over the Golan Heights and sever Syria from Iran as a necessary condition for coping with the nuclear problem. "Does that point to deep thinking? If we had listened to their advice and signed the agreement over the Golan Heights — where would we be today? Evidently under gunplay over [northern town of] Kiryat Shmona or Kfar Blum."